Too long, too vapid and too expensive. Like many journalism instructors, R. Thomas Berner was familiar with these complaints, which college students often made about the textbooks assigned in their reporting, writing and copy editing classes. 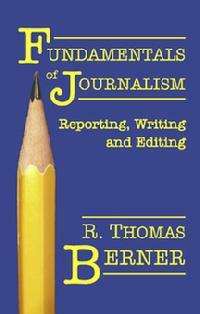 So Berner, a professor emeritus at Pennsylvania State University, decided to write Fundamentals of Journalism: Reporting, Writing and Editing, a student-friendly book with an affordable list price of only $29.95. The 300-page trade-sized (5� -by-8�-inch) book distills much of the content in other books Berner wrote during his 28 years at Penn State, which included The Process of Writing News, Writing Literary Features, The Literature of Journalism, The Process of Editing, and Language Skills for Journalists. "When I taught reporting classes in the 1990s, I used Prof. Berner's Language Skills for Journalists," said David Demers, publisher of Marquette Books. "I liked it because it was very well written and student-friendly. So I'm just delighted that he has given us an opportunity to publish his newest book." In Fundamentals of Journalism, Chapters 1 through 7 (from "News" to "Other Story Types") are ideal for beginning newswriting and reporting courses. Chapters 4 through 8 (from "Reporting" to "Narrative Nonfiction") fit well with feature writing courses. And Chapters 9 through 15 ("Copy Editor" through "News Evaluation") along with a review of Chapter 6 ("Responsible Journalism") are well suited for copy editing courses. ABOUT THE AUTHOR: R. Thomas Berner is professor emeritus of journalism and American studies at Pennsylvania State University, where he taught reporting, writing and copyediting courses for more 28 years. He lives in New Mexico and currently teaches an online communication course and continues to do freelance writing and editing. He has written seven books, including The Literature of Journalism: Text and Context. He was a 1994 and 2005 Fulbright lecturer in China and has published op-ed pieces on China in, among others, the Christian Science Monitor and the Los Angeles Times.